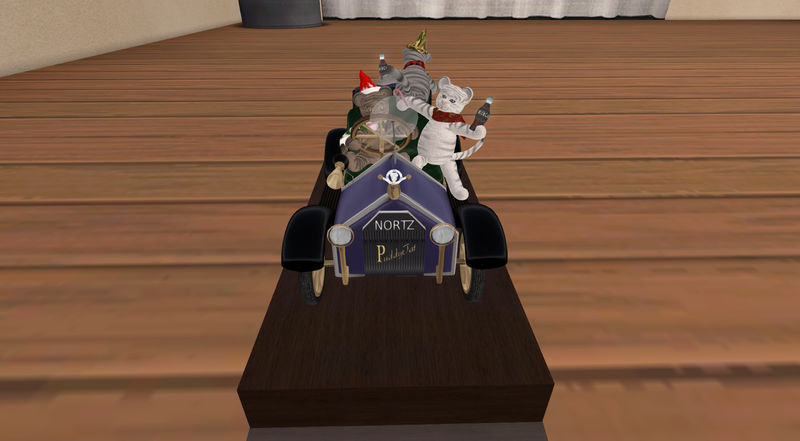 I am not usually much for sending Holiday Greetings in SL, but this year the passing of an SL friend (Mr. Whybrow) reminded me how much my SL friends mean to me. As much as I love (and am known for) SL fashion and shopping, it wouldn't be enough to keep me in SL without all the People and Friends I have met over the years. Fashionistas, Steampunks, everyone. You've made my SL far far more enjoyable. To you and yours, I wish the best this Holiday Season. Gratuitous pictures, it's what I do. Taken at my home in St. John with my utterly primmy Fabulous fashionista christmas tree. Dress is from Twelfth Night. Mr. Alastair Whybrow's of Caledon typist, has passed away in RL, of my most hated enemy.... cancer. He and his shopgirl were amongst my friends. We talked fairly often about numerous topics: music, art, Caledon, jewelry, building, shopping with shopgirls. He made my Second Life a better place. One time, Mr. Whybrow had made a formal parure and wanted my advice on "formal hair" for the necessary displays that the shopgirl would model for. So I took the shopgirl shopping. To me, this would work well in Victorian/Edwardian/old-timey decorated houses, with it's gold and burgundy and rich browns. It comes with everything pictured. 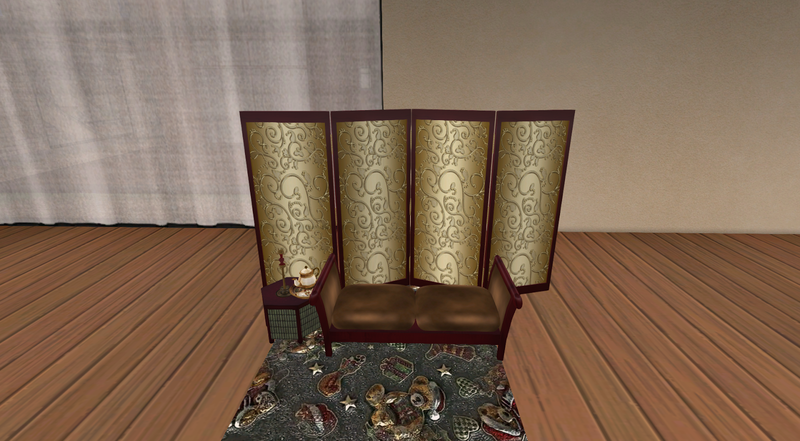 Divan, table, teapot with rolls, lamp, carpet. LI is only 10 total, 15 prims by the old system. 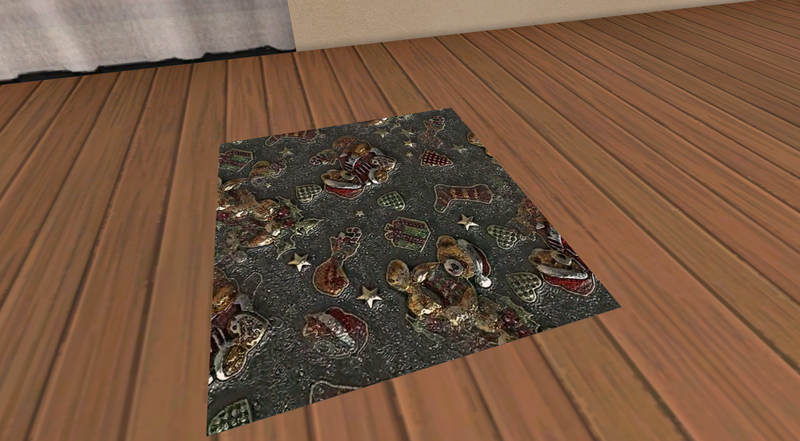 The Teddy bear carpet is the most "Christmas-y" part of the set, but as shown it's separate. Cost is 350L$ which is a fair price for this set, considering some divans would cost that alone. Well worth picking it up, even if you don't use it all together. Without the carpet, it would even work well as a boudoir set. Heck, I'd have probably picked it up for just the screen and hexagon table. Had a table like that in RL a few years back, lost it in a flood sad to say. 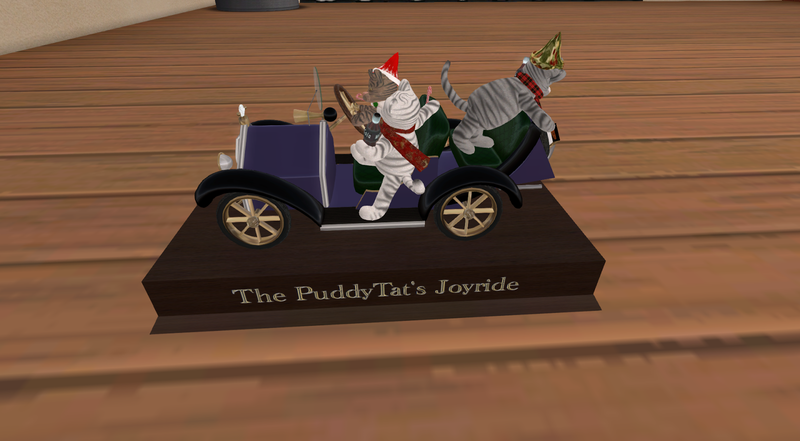 Christmas Expo: True North's, Puddy Tat's Joyride. What more can you say other than it's cute cats in New Years party hats and scarves going for a joyride while drinking Milka-Cola. Now that's how Cats party. Which my cat would so totally do if she could drive. A simple console table (console tables are designed to be put against a wall), that you put decorations on this time of year. My family had a table like this when I was young, it had our record player on it, and it was large enough for the player and decorations. It wasn't as tall as this one and was black, but was very similar. This set comes with all seen here, including the wreath and the doily, which is a separate object so you can use it under other things. The star on the manger twinkles and the candle lights at a touch. The set is Mesh, and 12LI, which isn't bad at all. and when the Holiday is over, you can remove the manger and wreath and leave the table, candle, and rug out. Can't beat a table like this for versatility. As is known, Cancer is on my Naughty List. 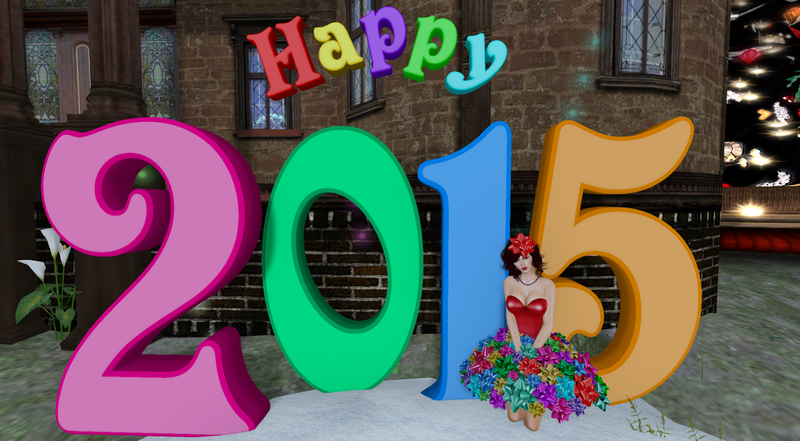 Considering how many people I know in RL and SL who are survivors or are dealing with cancer.... I really don't like cancer and try to do what I can to support the fight against it. 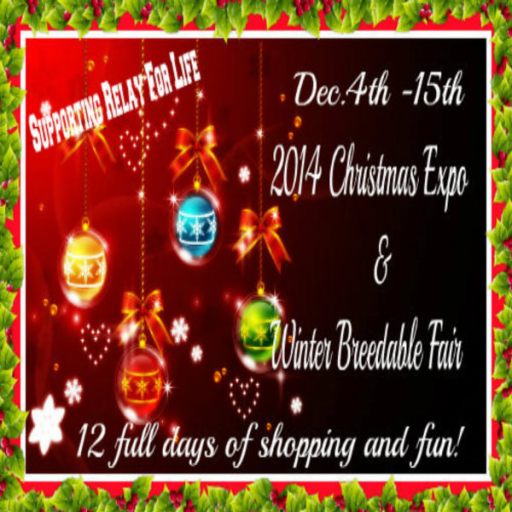 It's been a week since it opened (Yes I'm late, RL got in the way), but the American Cancer Society's winter fundraiser in SL, the 2014 Christmas Expo & Winter Breedables fair is open. It is the ONLY offseason fundraising event the Relay For Life does in SL. And trust me, they have a ton of stuff. Personally, I'd go for the decorations, rather than the clothing, but they have that too. They've got everything, tree lot, wreaths, snowglobes, snowmen. You want it, they got it. Except perhaps 200 shot range model air rifles with compasses in the stock, but you can't even get those in RL. You've got 4 days left! So get your decorations quick.